Hero MotorCorp has finally commenced deliveries of the new Glamour but for it to shake up the sales charts, it has to compete against the Honda Shine and the Bajaj V12. Of the three motorcycles in the discussion, the Hero Glamour is the most powerful of the lot. The Glamour makes peak power of 11.4bhp while the Shine SP and the V12 produce 10.16bhp and 10.5bhp respectively. In terms of torque too, the Glamour ranks higher than its rivals. The max torque of 11Nm that the Hero makes also gives it an edge over the Honda that makes 10.3Nm. The Bajaj’s torque is marginally lesser than the Glamour at 10.9Nm. As far as the transmission goes, the Glamour is the only motorcycle to be mated to a 4-speed transmission while the other two are paired with a 5-speed box. Although the numbers show that the Shine SP makes the least power and torque of the lot, consider its 123kg kerb weight into the calculation and the equation changes altogether. The Bajaj V12 is the heaviest of the lot at 133kg. The Glamour with the disc brake option weighs 127kg. As far as the engine and weight are concerned, all three motorcycles are more or less equally matched and only a thorough text will reveal which of the three performs better on the road. Although it doesn't look like it, the Bajaj V12 is the longest of the three motorcycles. The V12 is 2,040mm and at 1,315mm it also has the longest wheelbase of the lot.The Glamour’s length stands at 2,023 while the Shine SP is the shortest of the lot at 2,007mm. The wheelbase of both these motorcycles stands at 1,262mm and 1,266mm respectively. To the delight of a lot of short riders, the V12’s seat is a lot lower to the ground at 780mm. The Glamour’s seat is marginally higher at 790mm. Meanwhile, at 800mm the Shine SP has the tallest seat height. The efficiency of these motorcycles is more or less similar. While the V12 and Shine SP claim 65kmpl, Hero claims that the Glamour can go a distance of about 60km in a litre of fuel in real world conditions. Speaking of fuel efficiency, the Hero MotoCorp has fitted their patented i3s tech in the Glamour as well. This technology is essentially like the start/stop feature that we find in cars quite often. When stopped at a red light, the engine automatically cuts off resulting in better fuel efficiency. To start the bike again, one simply has to engage the clutch. But the Glamour is not the only bike in this comparison to come with such advanced tech. The Shine SP makes use of Honda Eco Tech (HET) and the Combi Brake System (CBS). While Hero and Honda have tech on their side, Bajaj has the advantage of its INS Vikrant lineage working in its favour. 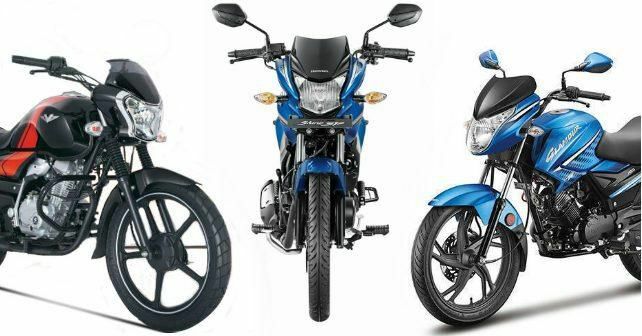 In terms of price, the Bajaj V12 is the cheapest of the lot at Rs 59,552 for the disc brake option. The similarly specced Glamour carries a sticker price of Rs 60,860. The Honda Offering with the CBS option is the most expensive of the lot at Rs 65,181. The Japanese bike maker also has a disc brake variant without the option of CBS but that too costs Rs 63,181. All prices ex-showroom Delhi.